You can't really find them easily, but a universal stage is amongst the most useful of extreme macro micro-movement stages, being the only device that can give you a perfect four degrees of freedom. You can buy them, but at an eye-watering US$23,000, universal stages are not exactly everyday purchases so being able to make something vaguely similar for a fraction of the price is a pretty cool thing. What is a Universal Stage? The DIY Universal Stage, showing the three ¼ concentric arms that are left over from the sailboat's candle holder which has been glued onto a round perspex base that can rotate on a pivot. Every way that you rotate the arm, the specimen stays at a fixed point, which is ideal for the extreme macro photographer, because there's no need to refocus the camera whilst composing the shot. A proper universal stage is a device that consists of concentric, graduated rings that can be tilted (via gimbals) and rotated. In extreme macro terms, it is most similar to a series of goniometers combined together to allow the photographer to rotate the specimen round to any angle, up and down and side to side. Goniometers are ok, but they're a bit on the pricey side for what they do and the problem with these is that if you stack them, their rotation points don't match. The nice thing though, about a universal stage, is that it not only allows the photographer to reposition the specimen, but it also keeps the specimen in focus whilst it's doing this. That's because the specimen is at the centre of a set of circular mounts, and rotating the mounts to change the perspective of the specimen keeps it at the centre so keeps it in focus. Ie rotation without translation. Whilst researching a patent claimed by Cognisys for electronic stacking stages, I came across Patent US 20130342655, Method and apparatus for macro photographic stereo imaging. This is a patent issued in 2013 to an Anthony Gutierrez, involved primarily with apparatus that "At any single position of the translation device along the longitudinal axis of the member, as the specimen is rotated around the first and second axes, the spatial location of the specimen remains substantially the same." 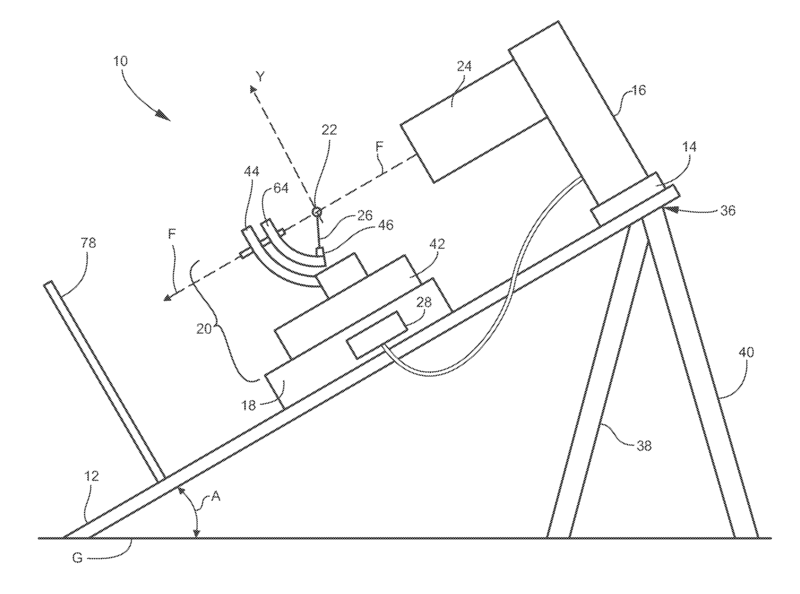 This is an almost exact copy of my universal stage patented after I'd put details online! (compare this drawing of the patented apparatus here with a photo of my widget published online prior to the patent here). If nothing else, my device should serve as prior art for any legal claim against anyone legally challenged by Gutierrez developing such a product. The business end of a DIY universal stage. The pin is inside a magnetix joint (magnetic) which can be put on several micro magnets fixed into the innermost arm. This gives a variety of angles to mount the pin at. I made my universal stage from a sailboat's candle holder which is actually a metal gimbal. I took the whole things apart and hacked off half the arms to have the minimum metal armage I needed for 1440° control. I replaced the original nuts holding it together loosely with some finer nuts with spacers inside them, and used a double nut mechanism to bind the innermost rings. At the bottom I removed the original base and glued on a circular 1cm thick perspex base instead. On this base, I drilled a small hole on the bottom into which fitted a small stud that also fits into a hole that I made in the microscope stage. This gives me rotation at the base, the first degree of freedom. The second and third degrees of freedom are fairly obvious, the arms, and the 4th is the pin holder, which is actually a part requisitioned from an abandoned son's Magnetix set. Magnetix has a lot of little magnets in plastic shapes and by cutting out one of those and having some handy black adhesive tack inside. The tack is perfect for pushing in a pin with a specimen on the end, and the plastic shape can be rotated on the magnet giving the 4th degree of freedom. 1st Degree of Freedom Rotation round the base, using a circular piece of perspex and stud fitting between it and the stage. 360° movement. 2nd Degree of Freedom The outermost arm that you can see in the picture. 360° movement. 3rd Degree of Freedom The innermost arm that you can see in the picture. 360° movement. 4th Degree of Freedom Pin rotation, the mechanism being a magnetic coupling between the pin holder and the innermost arm. I put a series of magnetics sourced magnets into the innermost arm. 360° movement. The universal stage usually lives on the microscope stage, and they complement each other perfectly. The reason that I cut off half the arms isn't for looks, it's to allow a lens to get into the radius of the circles so to allow as much movement as possible. Had I left the full half rings on I would not have been able to get the lenses inside. The original sailing thing is made out of shiny reflective metal so it has obvious reflection potential. I spray painted the whole thing black and glued Velcro on the arms to eliminate all reflections. Gives it a bit of a furry retro look but works just fine. Something which just occurred to me is to take a 2"-3" diameter piece of PVC pipe and cut a 1/4"-1/2" slice off of one end. Then take the resulting ring and cut it into quarters. Then the quarters could be drilled and assembled just as in the example in the article. The pieces can be spray painted flat black if desired. If you didn't want to use PVC, you could use copper pipe instead. Yes and no -- but good thinking! The thing about this device is that the arms fit inside each other with a spacer in between, and cutting pieces from the same pipe wouldn't achieve that. But, if you can find the different diameter pipes to account for the spacer, then it'd certainly be worth a shot! In that case, you could use 1/4 sections of 2", 3", and 4" PVC respectively. Inspired by your article to build my own I searched online for raw material and found a source for gimbaled ship's oil lamp holders that appear ideal: https://www.fisheriessupply.com/weems-and-plath-oil-lamp-gimbal. With a whole planet to search, turns out the source is nearby, in Seattle, WA. BTW after purchasing gimbaled ship's oil lamp holder from Fisheries Supply in Seattle, WA, and comparing with photographs in this article, it is identical. Mine is now disassembled, with portions to be removed marked (patient prepared for surgery). I will be ordering small cylindrical magnets from KJ Magnetics, http://www.kjmagnetics.com.